Need we say more? Check this out, rebels! "Planning to have a video-game themed wedding? Then you’ll need an appropriate cake. 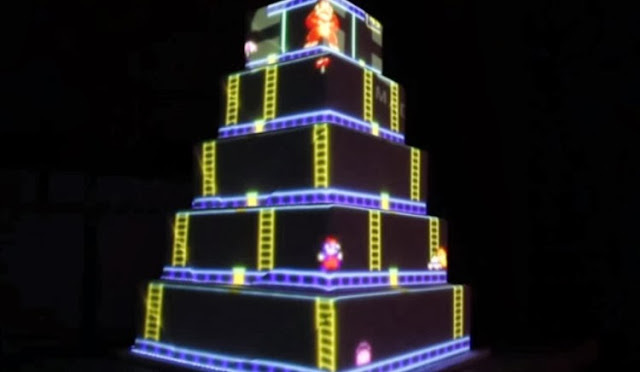 And while cakes based on Super Mario, Portal and the PS3 are undoubtedly awesome, they’re not actually much fun to play.New-Jersey-based Posh Entertainment, however, has upped the wedding cake game by projecting a variety of playable games directly onto the multi-tiered treat. In other words, you're playing video games on a cake. That’s a fully edible cake there, people, on which you can play Donkey Kong, Dig Dug, Ice Climber, Pac Man, Sonic the Hedgehog and Candy Crush Saga. The cake itself was made by catering company Meals For Reals, while the projection mapping -- the real key to getting this cake console working -- was handled by both Posh and Invader Visuals. The only problem? When you eat the cake, it's game over. So never eat this cake. Unique idea. I love it.